Aboriginal and Torres Strait Islander is a tribe of Indigenous Australians. They've lived and maintain homeland Australia for almost 60,000 years using the legal system and their own government. Perhaps, they settled on the smallest continent for thousands of years ago. But then they were displaced by the newcomers who are more "intelligent" than white Europeans. Physically, the Aborigines as the people of Papua: dark skin and curly hair, but now it is subject to change, certain brown-skinned and curly haired. Their origins have the same land. Scientists say, because the natural processes that move, the mainland was then separated. In the south into Australia. While on the mainland north of the island of Papua that are in Indonesia. Fit with the name Australia comes from the word "Australis" which in Latin means "South", while the Dutch call "Australische" which has the same meaning. Dark-skinned tribes were later separated. Both are undergoing their own fate in different countries. In both Indonesia and Australia because of their difficult existence backwardness. Apparently, a striking difference in skin color on the mainland south of the aborigines make less lucky. The migrants in Australia who treat comprised of smooth white original was not reasonable. 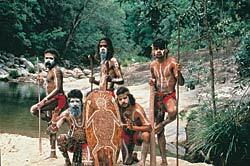 At the moment the Australian commonwealth stood on January 1, 1701 for example, the aborigines are considered part of the fauna! But the view Australia was gradually softened and provide space for indigenous people are after (supposedly) a lot of murder. The trick is rather unique: the political assimilation of Australia set to mix two types of people who have different skin color. Aboriginal children were forcibly separated from their families and placed in an orphanage for the "bleached". Much later taken care of by the whites as laborers or servants. Boys are collected to serve as free labor on remote farms. They were punished severely when the act is not wrong or something unpleasant. Just as apartheid, apparently the fate of aborigines is also determined by skin color. From this came the term "the Stolen Generation", which makes current Prime Minister of Australia, Kevin Rudd, apologized.